It was a beautiful October Saturday that was perfect for running and even better for giving back to the community through the Danny Gans Memorial Champions Run for Life. The temperatures were a perfect 70 degrees and the event staff did an outstanding job of creating a festive, vibrant atmosphere that included vendor booths, free donuts for the kids and a spirited warm-up before the race began. The first race of the day was the untimed 1 mile run/walk, where there were around 35 participants. We had four runners in this event and they were happy, loose and excited to get going. 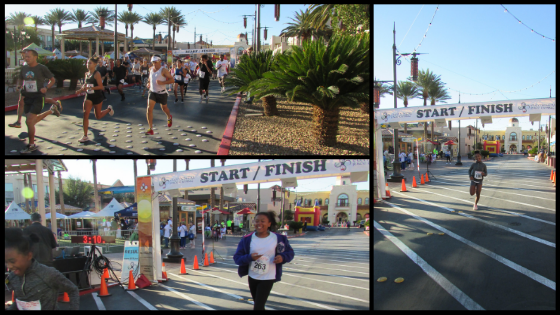 Their enthusiasm showed in the race as Lashari Patterson-Davis and Lilianah Davis masterfully maneuvered the course, taking in the sights that took them down Town Square streets to the South outskirts of the stores, behind the theater, then to the finish line where Lashari found a burst of speed to edge Lilianah to the tape. They finished 1st and 2nd and looked great as they appeared as fresh as they were at the start of the race. Right behind them were Henry and Masen Mitchell. It was wonderful seeing this father-son duel. Masen was a trouper as he completed his first race and did not stop once. What was really encouraging was seeing him sprint the last 50 meters with his father. He closed the gap on the runner in front of him but ran out of real estate at the finish line. Masen’s speed was on full display and will be something to behold come track season. The 5K course was beautifully laid out with a nice mixture of flats, hills and scenery. Over 100 runners and walkers gathered at the starting line and as the gun sounded, Coach Stepfon took Jeramiah Davis and Jordan Lewis out at a strong pace. At the one mile mark, Coach Stepfon pulled away. While trying to keep pace with Coach Stepfon, Jeramiah opened up a 200 meter lead on Jordan and maintained it until the last mile where Jordan was pushing the pace and closing the gap quickly. With a final kick over the final 100 meters, Jeramiah rounded the corner and crossed the finish line in 24:02, just ahead of Jordan in 24:05. Both took 1st in their age group. Coach Stepfon turned in an outstanding time of 20:37 even though he turned around to check on Jeramiah and Jordan. Our youngest runner, Jordan Gowdy, also participated in the 5K with Coach DeVon. The primary goal was to give him exposure to a race environment and allow him to run with his age group. Jordan did an excellent job covering the 3.1 mile course in 27:08 and finishing 1st in his age group. As he moves on to compete in USATF Cross Country, his race distances will change to 1.24 miles and become faster and more competitive. He possesses a wealth of talent and only lacks distance racing experience to realize his potential. In closing, the Las Vegas Elite Runners staff thanks the Danny Gans Memorial foundation for putting on such a fantastic event. Our founder, Naomi Davis is a cancer survivor so this hits home. We wish you the best and will continue to support this worthy cause for a cure of cancer in the future.